The Israelis and Palestinians are on the verge of signing a historic comprehensive treaty. After decades of conflict, the world awaits a new era of peace. But now a new threat is rising. The Islamic State, a dangerous al Qaeda offshoot also known as ISIS is on the rampage. Already they have attacked two governments, brutally killing anyone who stands in their way. Now they have their sights set on a third target. But who will it be? The United States? Israel? Or someone else? When award-winning New York Times correspondent J. B. Collins hears rumors that ISIS has captured a cache of chemical weapons, he risks everything by sneaking into Syria to locate and interview the commander of the terrorist organisation. Under intense pressure from multiple governments not to publish his findings, he faces a decision that could cost him his career - or his life. With the American president set to visit the region, the Middle East teeters on the edge of explosion. As a war-weary world hopes for peace, and a bloodthirsty terrorist regime grows in strength, who will prevail? Can Collins, with the help of a mysterious and beautiful Mossad agent, alert the world to the danger before ISIS can unleash its apopcalyptic vision? Or with chemical weapons in the hands of radical Islamic jihadists, is it already too late? 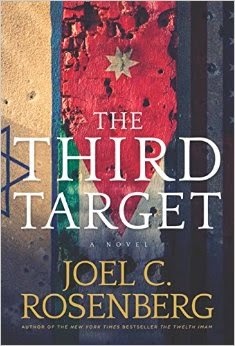 Joel C. Rosenberg states in the note from the author that when he started creating The Third Target in 2013, that he and his publisher had never heard of ISIS - indeed, I think that most of the world had not heard of them. Now, two years later, they are gaining more notoriety. As with all of Rosenberg's books The Third Target is fast paced and filled with danger at every turn of the page. The story resonates deeply with a warning that goes beyond the fictional and enters reality, a story where fact and fiction are somewhat blurred in the reflection of current real world events. It is true that Rosenberg studies the Middle East closely, and this attention to detail is reflected in the accuracy in his books. J. B. Collins is following in his grandfather's footsteps, decades earlier A. B. Collins was the foreign correspondent for the Associated Press, in Cairo. A.B. was about to meet a Jordanian king when suddenly and without warning they were attacked and the King was killed in a terrorist attack, right in front of A. B.
J. B. prefers his Kings alive and well thank you very much - and is determined to keep them that way, so determined, that he takes up weapons to protect them - and himself - from a terrorist attack on the day of the announcement of a peace agreement. And not just any peace agreement, the one that has the world talking - an agreement between the Palestinians and Israelis. But before we get to that ... J. B. has the dubious pleasure of interviewing the head of IS, and in reality only escapes certain death because it is determined that he is far more useful to them alive than dead. I thoroughly recommend this book to anyone who is interested in current world events and biblical prophecy - yes, The Third Target is a work of fiction, but the accuracy with which this story is told is a true reflection of what is happening and what is to come.